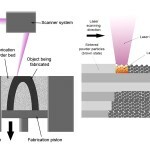 SLS uses high power laser (for example CO2 laser) to fuse small particles of plastic, metal or ceramic powder together, layer-by-layer, to form a solid model. The system consists of a laser, part chamber, and control system. Because SLS requires the use of high-powered lasers, it is often more expensive (and potentially more dangerous) for use at home. However, there are several intrepid inventors out there who are working on their own versions of desktop SLS printers.